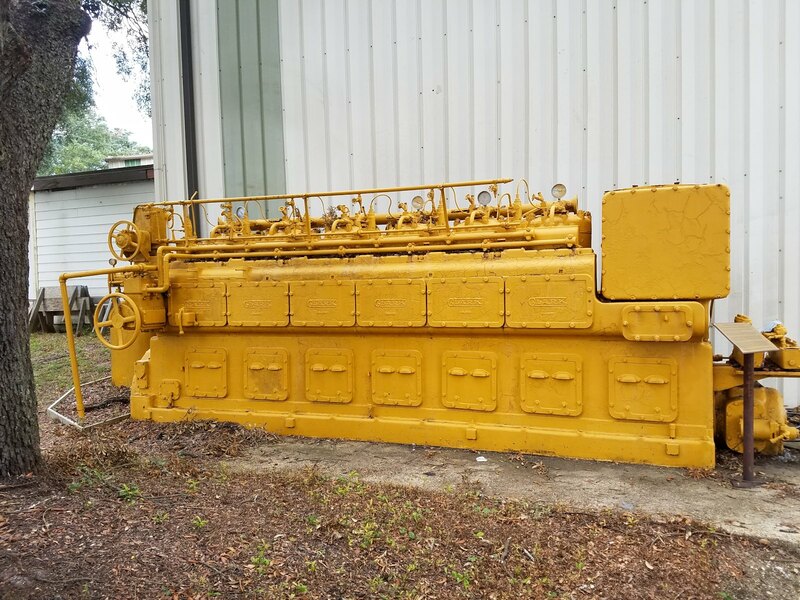 This is a Clark MD6-33042LH Diesel, serial number 88078003, one of only 108 of this model built by Clark Bros Company, a division of Dresser-Clark Co. for the US Army during WWII. This engine is number 58 of 108 and assembled in 1943. Only 3 of this model engine are still known to exist worldwide, this one on display here at Pelican's Perch Marina, one in Europe in a museum on static display and one still in an 86' Army Tug, ST-479, now a personal yacht named "Tiger" in Stockholm, Sweden that as of 2009, was still in running condition. 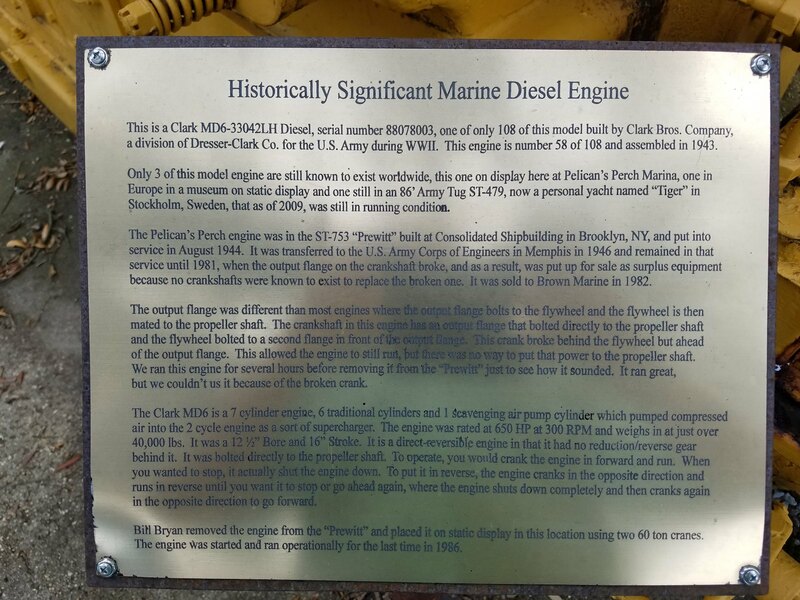 The Pelican's Perch engine was in the ST-753 "Prewitt" built at Consolidated Shipbuilding in Brooklyn, NY and put into service in August, 1944. 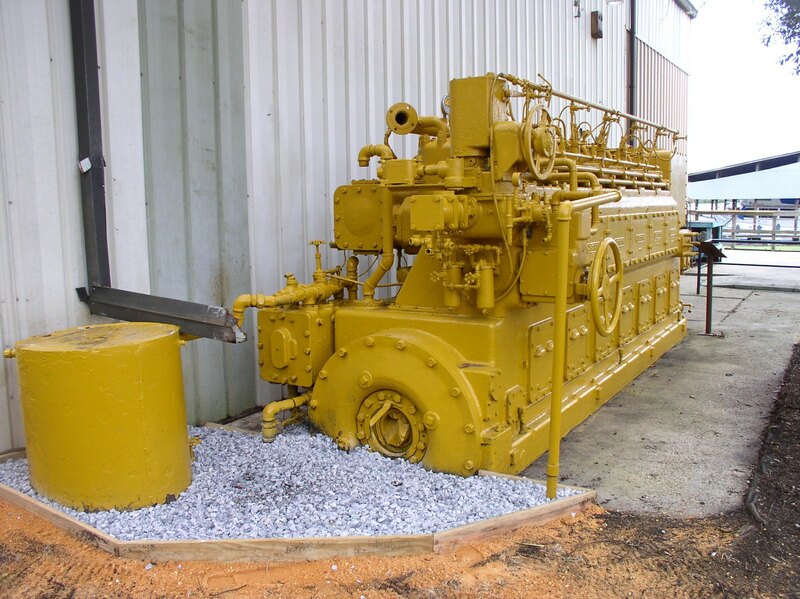 It was transferred to the US Army Corps of Engineers in Memphis in 1946 and remained in that service until 1981, when the output flange on the crankshaft broke and as a result, was put up for sale as surplus equipment because no crankshafts were known to exist to replace the broken one. It was sold to Brown Marine in 1982. The output flange was different than most engines where the output flange bolts to the flywheel and the flywheel is then mated to the propeller shaft. The crankshaft in this engine has an output flange that bolted directly to the propeller shaft and the flywheel bolted to a second flange in FRONT of the output flange. This crank broke behind the flywheel but ahead of the output flange. This allowed the engine to still run, but there was no way to put that power to the propeller shaft. We ran this engine for several hours before removing it from the PREWITT just to see how it sounded. It ran great, but we couldn't use it because of the broken crank. The Clark MD6 is a 7 cylinder engine, 6 traditional cylinders and 1 scavenging air pump cylinder which pumped compressed air into the 2 cycle engine as a sort of supercharger. The engine was rated at 650HP at 300RPM and weighs in at just over 40,000 lbs. It has a 12-1/2" Bore and 16" Stroke. It is a direct-reversible engine in that it had no reduction/reverse gear behind it. It was bolted directly to the propeller shaft. To operate, you would crank the engine in forward and run. When you wanted to stop, it actually shut the engine down. To put it in reverse, the engine cranks in the opposite direction and runs in reverse until you want to stop or go ahead again, where the engine shuts down completely and then cranks again in the opposite direction to go forward. 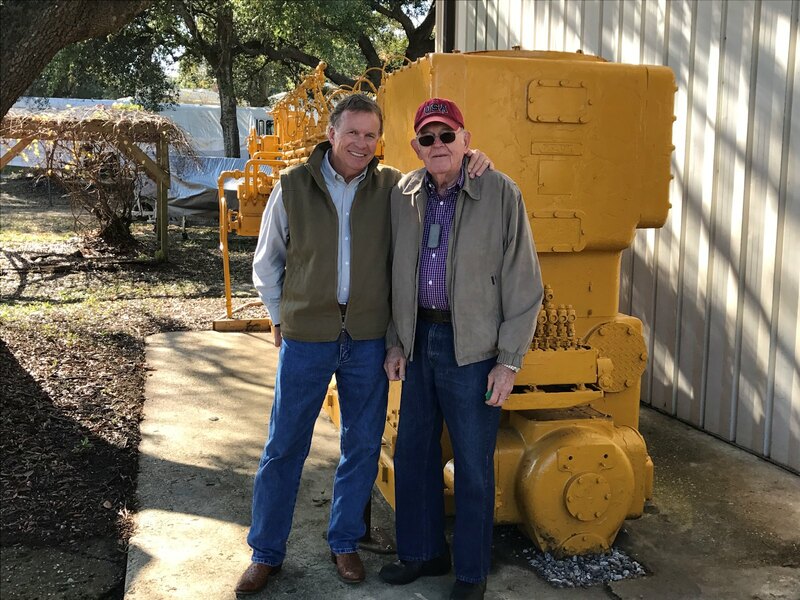 Bill Bryan (pictured above) removed this historic engine from the "Prewitt" and placed it on static display here at Pensacola's Pelican's Perch Marina using two 60 ton cranes. The engine was started and run operationally for the last time in 1986.